45'-27' Articulated self leveling tow able trailer boom with 4' x 2' 6" 500lb platform. Can be towed by a 1/2 ton pu truck. 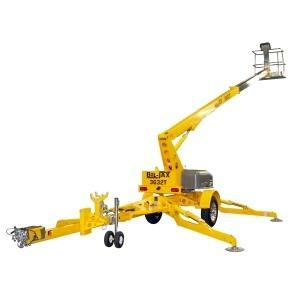 Working height 51', Platform Height 47', reach from center 27', reach from footpad 21' Up and over height 20' 9"
Stowed length 19'6", Width 5' 6", Height 6' 5"
* Please call us for any questions on our boom lift 45 foot 27 articulated trailer mt rentals in Portland OR, Gresham OR, Milwaukee OR, and surrounding metro area.